If you want complete peace of mind Central Stairlifts can offer a range of service contracts for the maintainence and repair of your stairlift. As few or as many service visits per year you require. Full Parts and Labour cover can also be provided. Please phone for your free consultation to discuss your ongoing requirements. Even if you have not purchased or had your stairlift maintained by us, Central Stairlifts can still support you in the repair of your stairlift. We can offer a full repair service for many types of stairlift and will be pleased to offer a competitive quote. Please contact us with the make and number of your stairlift. All our contracted customers have the peace of mind that should they need us. We are available on call 24 hours per day 7 days per week. Why not call us on 01905 796 949 and gain a competitive quote. 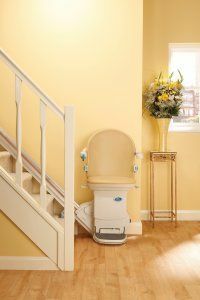 We will visit you in the comfort of your home to talk trough any stairlift requirements or problems you may have all free of charge and without any obligation our telephone lines are directed to one of our engineers who will be only to happy to discuss your requirements. A stairlift will give you back your independence and keep you in your own home.